Following an auto accident, you may be contacted by the at-fault driver’s insurance company. Often times, an adjuster will contact you and try to settle your claim right after the accident, when you don’t know the extent of your injuries and you are vulnerable. The adjuster may take advantage of your vulnerability and may tape record, with your permission, your conversation, and may get you to make statements minimizing your losses. This can be very damaging to your case. 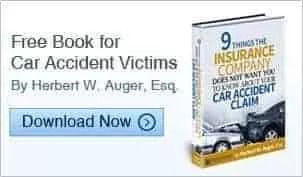 The personal injury lawyers at Auger & Auger recommend that you call for a free consultation and speak to an experienced attorney before you speak to the insurance company. The adjuster may act concerned for your loss, but remember, it is the job of the adjuster to pay you as little as possible. The adjuster is rewarded by the insurance company for paying you less than your case is worth. Let Auger & Auger handle the insurance company so that you can concentrate on getting well.